While there’s been much ado about the changing of the guard at the Fed, especially considering the tumultuous way the markets greeted Jerome Powell on his first day in office, there are potential “changes” coming to the BoJ, as outlined in a recent Nikkei article. While all signs point to Kuroda being selected for a second term, two new deputy governors are likely to be nominated later this year: Masayoshi Amamiya, BoJ Executive Director, and professor Masazumi Wakatabe. Amamiya is a career BoJ man and has been involved with all of the BoJ’s recent activities, including QE, yield curve control, and increased bond buying. Wakatabe is also a noted dove and expressed some of his views in an interview with Bloomberg late last year. 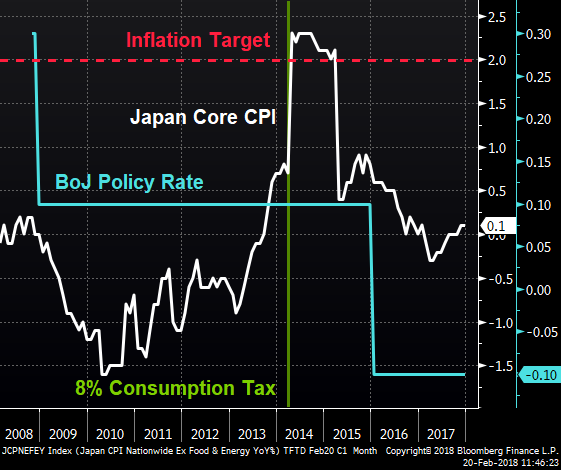 He has publicly pulled for the BoJ to prepare extra measures in anticipation of the already-twice-postponed consumption tax increase, slated to go into effect in October of 2019. He has also urged for an increase in the BoJ’s pace of JGB purchases. 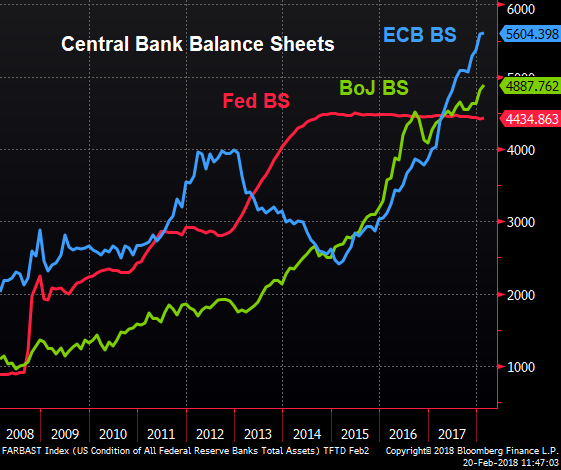 So while the Fed is now on the path of a balance sheet drawdown and the ECB is contemplating ending its purchases as soon as this September (See TFTD Jan 23), despite any upcoming personnel changes, the BoJ will remain a piteousness of doves, cooing until they see the whites of 2% inflation’s eyes. Two of the regional Federal Reserve Banks, Philadelphia and New York, put out their manufacturing numbers last week and it was a tale of two cities. The Philadelphia numbers beat estimates handily. Business Outlook was expected to come in at 21.8, dropping slightly from the previous month, but instead came in at 25.8, and the supplemental questions on inflation revealed business owners expected more inflation than they had back in November when the supplemental questions were last asked. Meanwhile, New York’s Empire Fed Manufacturing Survey saw a continued drop off in its reading, missing the expected 18.0 by nearly 5 points, with the 13.1 representing a decent drop from the previous months 17.7. But bridging the two surveys was Prices Paid. In addition to Prices Paid staying near “last month’s multiyear high” the Empire Fed had a record high in respondents expecting increased delivery times. Meanwhile, Philly Fed saw Prices Paid jump 12 points to the highest reading since May 2011. Both surveys also revealed positive expectations for capex, businesses’ plans “showed notable improvement” and “remained strong”. Whether these plans come to fruition, amid uncertainty about the effects of the recent tax cut and potential trade issues, remains to be seen, but the required optimism and confidence appears to be there.